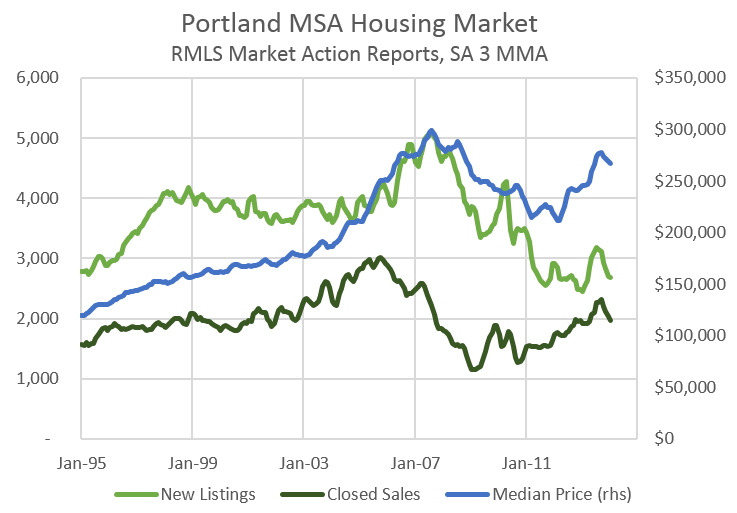 Three quick graphs showing the Portland housing market and one on the price outlook. First, given the tight market of increased demand and no sustained increases in supply, prices continue to see upward pressure. The past few months have cooled off somewhat — likely just the seasonal pattern, but possibly hints of sustained slowdown in price gains. So long as the limited supply of homes continues, it will remain a seller’s market. Demand has returned to that 2,000 per month level seen during the 1990s and early 2000s, while supply is very very low. Expectations are for supply to increase quite a bit in the next 2-3 years with new construction picking up strongly and more existing homes being sold as well. One item that is interesting is that with such a limited supply on the market, prices have jumped ahead of the overall housing stock. In a seller’s market, with competing bids, this is the pattern one would expect to see. As these more recently sold homes filter through into the overall housing stock, the home price indexes are now playing catch-up to the market. Over a longer period, these two measures of home prices should closely track each other, and moving forward they will likely converge. 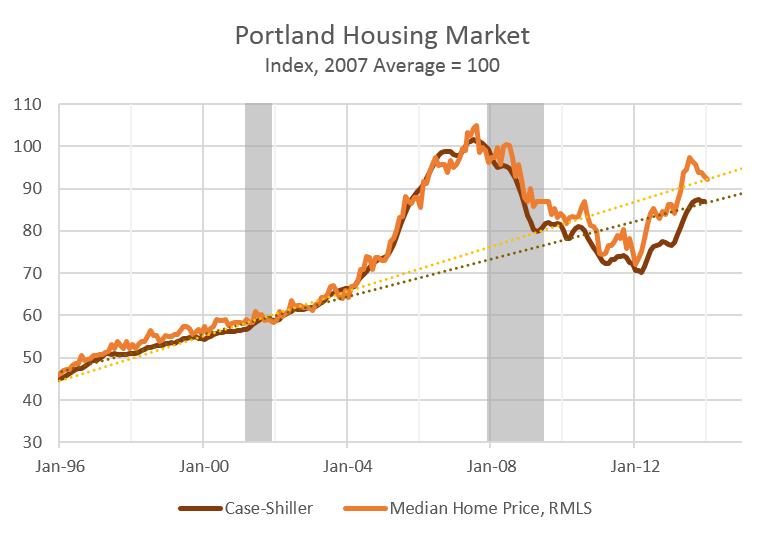 The two trend lines are based on the Case-Shiller for 1992-2003 and for 1996-2003, to produce a naive gauge of where prices might have been had we continued along at those growth rates over the past decade. Interestingly enough, even after the bubble and bust, prices today are somewhere around these naive trend lines. In terms of housing affordability, the cost of owning a home (financing, taxes, routine maintenance, etc) increased substantially in 2013 as prices rose along with interest rates. 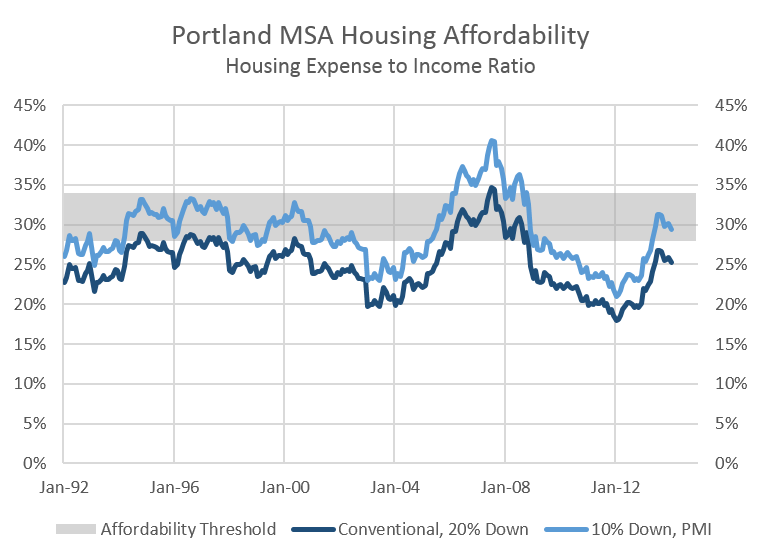 With price gains moderating and interest rates holding steady, so too is overall affordability. Our office’s baseline outlook for prices moving forward is simple: moderation. As supply increases to meet stronger demand, that will move the market away from a seller’s one to a neutral one or even a buyer’s market if supply increases enough to outstrip demand, which is not out of the question based on history. 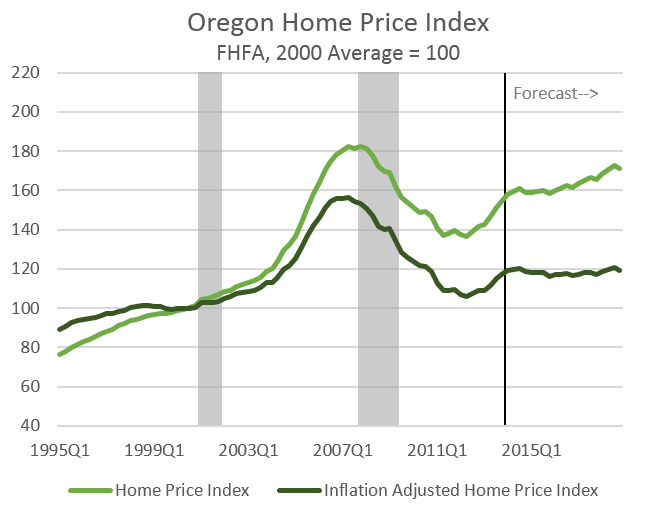 Prior to the bubble, home prices typically increased at the rate of inflation or just a bit stronger. We expect this to be the case moving forward, however in a world with 12% home price appreciation in the past year, one can quickly look pretty silly calling for inflation-adjusted prices to be effectively flat over the next couple of years. While the transition into a more stable, normal housing market equilibrium has not and likely will not be perfectly smooth, our office believes this outlook is fundamentally correct. Price gains will moderate. There is no question about that. The question is one of timing, and right now we expect it to happen soon, but the strong price gains are likely to continue until supply increases or demand falls. Hopefully this coming price moderation will be for good reasons (increased supply and a stronger economy) and not bad reasons (demand falling due to financing costs and a weaker economy).